D & S Vending Inc - D673-0033 - National 633/653/673 Water Tank Weld Kit- Better Quality & More Durable than OEM! 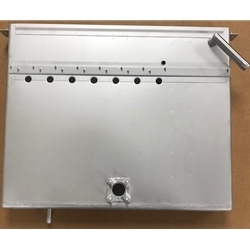 Home → Vending Machine Parts by Manufacturer → National/GPL → Coffee → 653 655 657 → D673-0033 - National 633/653/673 Water Tank Weld Kit- Better Quality & More Durable than OEM! D673-0033 - National 633/653/673 Water Tank Weld Kit- Better Quality & More Durable than OEM! National 633/653/673 Series Water Tank Weld Kit- Better Quality & More Durable than OEM! This replacement tank is heavier & more sturdy then the original, designed to last much longer in your machine. We've gone to a flat heater gasket design for better insulation as well as thicker heater bolts to prevent corrosion.